Thursday at SGC Richmond was my favorite day. I saw some magnificent art and watched a couple of great demonstrations. First thing in the morning there was an artist's presentation by Carl Pope in the big conference hall. I knew very little about Pope before hearing his talk. In 2000 his work was in the Whitney Biennial and most of the work he does is text-based, whether letterpressed, carved into rock, or carved onto his own skin. Some of his work (like the skin work) is hard to look at, but I like that it's socially engaged, that he uses language and that he involves the community in many of his pieces. 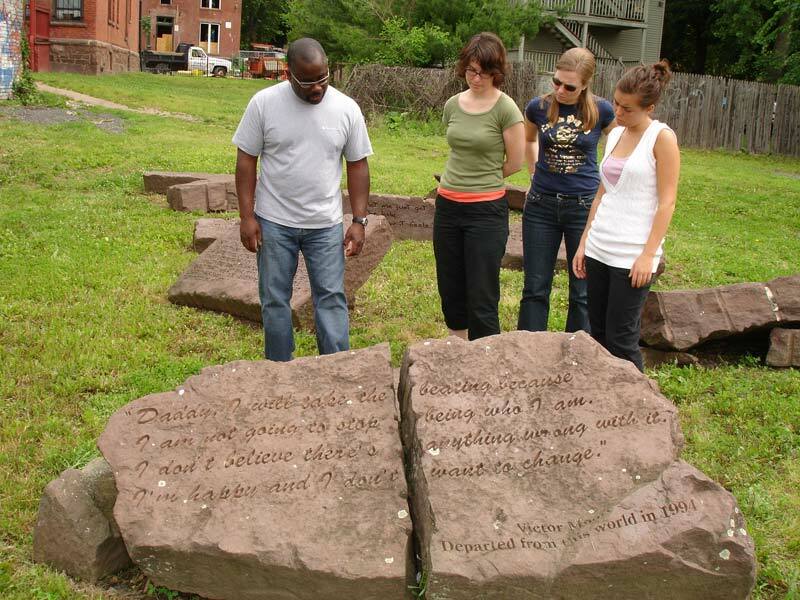 The project I liked the best was done in 1996 in Hartford CT called "Silent Wishes, Unconscious Prayers and Dreams...Fullfilled" in which Pope interviewed family and friends of several Hartford young people who had died as a result of violence. He then etched the words of the deceased as remembered by those close to them onto large boulders. I spent the rest of the day at Pennsylvania Academy of the Fine Arts (PAFA). 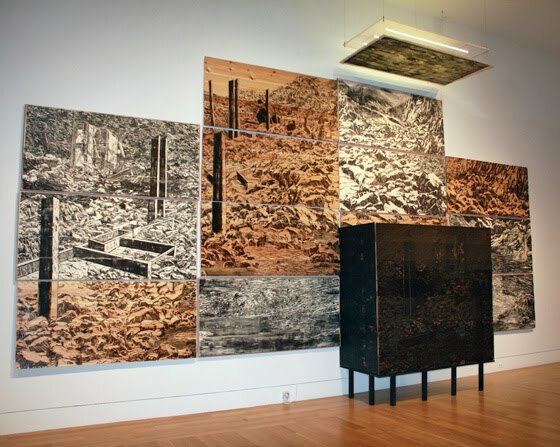 PAFA is one of five venues presenting the exhibition The Graphic Unconscious in conjunction with Philagrafika 2010, Philadelphia’s international festival celebrating the print in contemporary art. The PAFA exhibit was top on my list because there was so much relief work there and so many well-known artists. Unfortunately I got yelled at for taking photographs so I only have a couple of shots, but check out this article by artnet's Deborah Ripley for a full review of the show. Also at PAFA was an amazing exhibit of over 50 works by 25 contemporary artists all printed at C. R. Ettinger Studio over the past 10 years. I briefly met master printer Cindi Ettinger at IPCNY last winter, but I had no idea until now the range of the gorgeous work she produces. Her Philadelphia-based studio specializes in etching, but it's clear that she has no qualms about integrating new techniques as she collaborates with various artists. For example, there was a dimensional piece by Daniel Heyman on display that involved etchings printed directly onto plywood (right). The exhibit will be up until April 18 if you want to try to catch it. Last week I took a few days off to attend the Philadelphia SGC Conference, titled "Mark Remarque." I attended this annual conference once before, in Richmond VA in 2008, but since I was pretty new to printmaking in '08 I didn't know a soul at the Richmond conference. Although I enjoyed the content of that conference immensely I was uncomfortable socially. This year's Philadelphia conference was very different for me. Two years later I've made many contacts in the field, both online and locally, so I was at no loss for people to pal around with. It was wonderful to meet folks that I've known only virtually up until now, and it was also great to hang out with people from my local print studio, Zea Mays Printmaking. SGC Philadelphia also differed from SGC Richmond in that a huge city-wide print festival called Philagrafika 2010 was in progress during the conference. This raised the level of work that was on display markedly and made it seem as if the SGC conference was taking place all over the city. But before I went to Philly I stopped in New York to meet with Berlin-based artist/printmaker Eva Pietzcker and a print collector that I had made contact with in November through the IPCNY New Prints show. We had agreed to meet at the Metropolitan Museum of Art, which doesn't allow suitcases in the coat check room, so since I was rolling into Penn Station on Amtrak I needed to check my suitcase somewhere. I found a spot on W 36th Street and on my way out I noticed Dieu Donné, the nonprofit papermaking workshop. A series of glowing displays had caught my eye and a closer look revealed that they were watermark "drawings" by William Kentridge from an artists book called Sheets of Evidence. (The exhibit is up through April 24.) I spent about 20 minutes soaking in the work, then continued to make my way to the Met. I was early for our meeting, so I wandered around the Met and stumbled upon a magical and mysterious display of alabaster statues called "The Mourners." Apparently the Mourners are 15th century tomb sculptures from France. 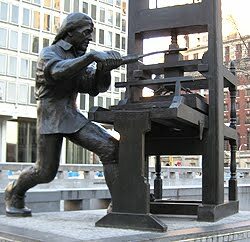 Each statue is about a foot high and each seems to possess its own personality and story. 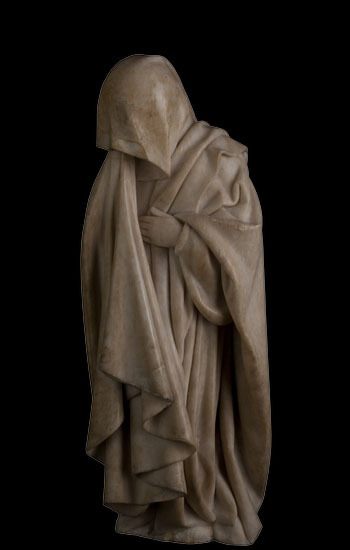 The Mourners web site allows you to look closely at each of the 40 or so statues and turn them 360 degrees. The physical exhibit will be at the Met through May 23. I sat on a bench with the mourners until it was time to rendezvous with my friends. After we ate lunch together, the collector and his wife took us to a Japanese art gallery called Scholten Japanese Art. It was Asia Week in NY and Scholten was showing some beautiful scrolls and other religious objects in a show called "Sacred Symbols in Profane Japan." Eva and I were both deeply drawn in by the exhibit. 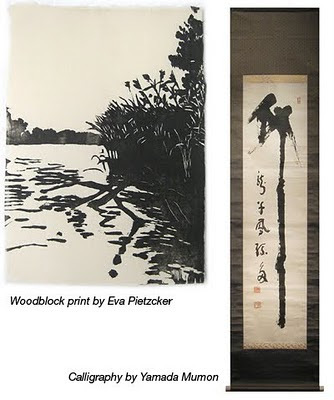 Eva's favorite piece was a 20th century calligraphy painting that was not unlike some of her own woodblock work in its strength and graphic power. My favorite piece at the gallery was this 14th century Buddha painting, and another one that was a scroll of 1,000 Buddhas. I'm grateful that my print collector friend escorted us to Scholten, as it's a high-end and intimate gallery that I probably would never have ventured into on my own. Director Katherine Martin was extremely warm and kind to us, though, and I feel that I'll be able to visit again without feeling too anxious. After a long day, I got back on the train and headed for Philadelphia and the Loews Hotel. Zea Mays Printmaking (ZMP) has just published a ten year anniversary portfolio titled "10." I picked mine up last week and it's beautiful. It's a suite of eleven prints produced by ZMP faculty artists including myself (my woodblock print 10 Little 9 Little Indians), Meredith Broberg, Liz Chalfin, Nancy Diessner, Anita S. Hunt, Louise Kohrman, Barry Moser, Lynn Peterfreund, Joyce Silverstone, Carol Wax and Mark Zunino. Each print is contained in its own letterpress printed folio and the entire set sits inside a golden silk clamshell box (above) made by artist/bookbinder Sarah Creighton. 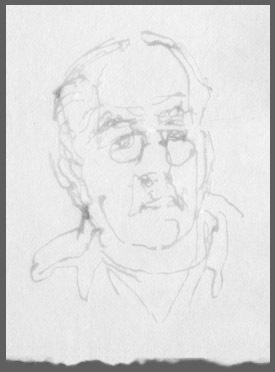 Craig Harbison, Professor Emeritus, Art History, University of Massachusetts, Amherst wrote the introductory essay. "10" will be one of the portfolios on display at this week's SGC Philadelphia Conference. If you're going to the conference, "10" will be hanging at University of the Arts. This etching by ZMP director Liz Chalfin captures the quiet light-filled beehive-like feeling of the studio. I was proud to be one of two relief printers represented in the portfolio, the other being Barry Moser. Here is Barry's engraving of James Joyce. I just got this gouge from McClain's Printmaking Supplies. I've been wanting something like this ever since I started working on large blocks -- a shallow u-shape that would make short work of clearing large areas. I love it! And it's not too hard to sharpen, either, because it's so shallow. Prepping for the SGC Philadelphia Conference this week. I'm looking forward to seeing/meeting some of my online printmaking pals. It's impossible to know from this vantange point whether Caleb Cheeshahteaumuck and Joel Iacoombs, the first two Native students to attend the Harvard Indian College, felt honored to be there or if they felt resistance, as Native Americans felt in the late 1800s when they were removed from their families and placed in government-run boarding schools. What we do know is that as early as the 1640s Puritan missionaries like John Eliot were establishing Indian "praying towns" in Massachusetts. Indians in praying towns dropped their Indian names and adopted English names (like "Caleb" and "Joel"), cut off their long hair, and wore English clothing. "Near this spot, from 1655 to 1698, stood the Indian College. 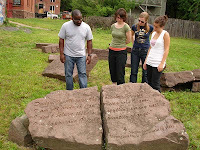 Here American Indian and English students lived and studied in accordance with the 1650 Charter of Harvard College calling for 'The Education of the English and Indian Youth of this Country." Today I added an impression behind Caleb and Joel of the Harvard College campus as it appeared in the mid 1700s, the earliest depiction I could find. Harvard is located in Cambridge, Massachusetts, but from the Indian perspective Harvard is actually situated in Wampanoag country, where the inhabitants had lived for approximately 10,000 years before English settlers arrived. At Harvard College in the late 1600s, English and Indian students were housed together in order to facilitate the goal of language exchange. The English sought to learn Algonquian well enough to preach to the natives, and the Wampanoag presumably wanted to learn English well enough to negotiate with the newcomers. After the four or five initial Indian students of the 1660-70s, the next Native American student to attend Harvard College was Benjamin Larnell of the Class of 1716. After Larnell died of a fever in 1714 there was a 256-year lull in Indian attendance at Harvard. Finally, in 1970, the American Indian Program was established and since then more than 800 Indians have earned Harvard degrees. Today there are more than 120 Indians on campus. Above is the Caleb and Joel block reduced once more, and the impression printed in a wash of burnt umber. I think that might be all I need to do here. Once I add a few other elements to the print I'll re-evaluate to see if the color balance has changed and if I need to reduce the block once more to add even darker tones or not. Caleb Cheeshahteaumuck, who I have imagined as the figure on the right, and Joel Iacoombs were the first two native American students at Harvard, enrolled in the class of 1665. Both young men were Aquinnah Wampanoag from Martha's Vineyard and both were from well-to-do families. Caleb was the son of a sachem (chief) and Joel was the son of a Wampanoag interpreter who worked with missionary Thomas Mayhew. Both would have attended preparatory school for five years before passing the exams to enter Harvard. They were probably both around age 15 when they arrived. Caleb was the only Native American student who actually graduated from Harvard Indian College. Unfortunately, he died of tuberculosis shortly after graduation at age 20. To the right is a photo of a bag from the Harvard Peabody Museum web site that is said to have belonged to Caleb. Joel also met a tragic end. He would have been his class valedictorian, but he was killed in a ship-wreck off Nantucket just before graduation. Their names were Caleb Cheeshahteaumuck and Joel Iacoombs, and they were the first two Native students to attend the Harvard Indian College, class of 1665. I'm totally making up what they looked like. When I first started making woodblock prints I would plan out all the colors and layers, carve all the blocks in succession, and then do all the printing at once according to the plan. Lots of times the prints came out pretty close to what I had planned, but I found that the printing phase felt sort of rigid and I would get all tense trying to make it come out the way I had planned. Over time I've developed a more leisurely approach where I carve a block or two, print a few passes, evaluate what I've got and then carve another block or two and print some more. This lets me respond to the various surprises and ideas that crop up as the print progresses. I still work with a plan, but I'm willing to change it as the print takes shape. In this case, though, I ran out of paper. I ordered some from McClain's and since I had to wait a few days for it to come I did the old method of carving all the blocks. This morning I printed the first one (above). It's funny, because already I'm thinking that one of the blocks I carved is unnecessary. We'll see what happens later, but if I don't use it I'll show it to you at the end. 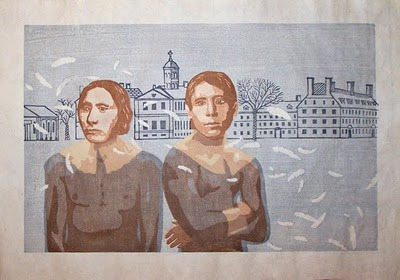 Nebraska woodcut artist extraordinaire Karen Kunc (www.karen-kunc.com) was in Massachusetts this week. 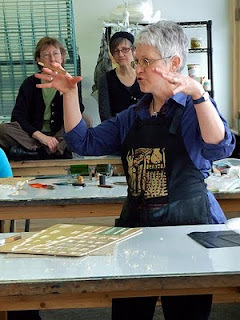 After a visit to Wheaton College in Norton where she had a show, she came to my town and gave a demonstration at Zea Mays Printmaking. The photo on the left by Tracy Ducasse is Karen at Zea Mays. (That's me behind her in the black knit hat.) You can see more of Tracy's great photos of the day on her Flickr site. The demonstration was short but wonderful. Although Karen uses oil based litho inks rather than the waterbased inks of moku hanga, I learned a great deal from watching her and I can feel all the information rolling around inside me. I have a feeling that a few months from now I'm going to look back and see this encounter as having had a big influence on me. One of the things that delighted me the most was that Karen is as lovely and vivid as her work. I thoroughly enjoyed meeting her and watching her print. If you'd like to see a sample of her in action, there are some videos posted on the Baren Forum blog of a demo Karen did at Sev Shoon Arts Center in Seattle.